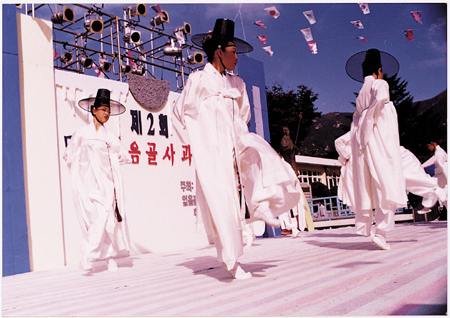 Korea has many festivals which are celebrated through music, dance, arts, and the theater. These festivals have roots in traditional customs of the regions that celebrate them. The biggest traditional culture festival is 'Chunhyang Festival' which takes place in Namwon city, Jeollabuk-do province. "Chunhyang" is the name of the heroine of an old musical drama famous in Namwon. This festival praises her faithfulness and participants ask to inherit her spirit. The performance opens on April 8th, according to the lunar calender, each year. The Chunhyang Festival comprises of more than 40 folk events ?street masquerades, processions, farmers percussion dance, musical performances, Ssireum and Chunhyang Beauty Queen contests, and much more. Namwon Chunhyang Festival takes place over three or four days. The event is a great success with 200,000 people attending. Other cultural festivals include 'Gossaum Nori' in Gwangju city (Jeollanam-do province), 'Moon Greeting Festival' in Busan (Gyeonsangnam-do province), and 'Gijishi Judarigi Festival' in Dangjin-gun (Chungcheongnam-do province). Reccommended Art Festivals include 'Puppet Festival Chuncheon' (Gangwon-do province), 'Rock Festival' in Busan, 'Sinchon Culture Festival' (Seoul), 'Wang-in Culture Festival' (Young-am city, Jeollanam-do Province), and > > 'Royal Azalea Blossom Festival' (Jeju Island). Gyongsangnam-do, Jellanam-do, and Gyeonggi-do are the regions that hold the most annual festivals, with 52, 51, and 49 respectively. The festivals are usually held during September and October, when it's bright and clear, and April and May when it's warm.